Drive Activity comes in quite handy, if you have more than one hard drive in your computer. Since it is sometimes not that easy to determine which hard drive is currently busy or idle, if you only have your ears and one hard drive LED for all your hard drives. With Drive Activity it is therefore quite easy to keep an eye on possible performance bottlenecks in your system. You now can choose if you want to combine multiple partitions (logical disks) of a physical disk into a single graph or not. 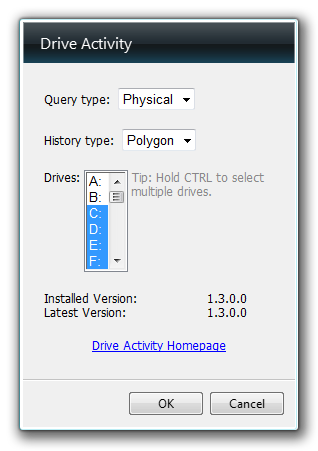 Option to specify which drives to show/hide. Fixed Bug that prevented the display of hard drives with more than one partition. Increased maximum number of supported hard drives to 12.